I woke up Tuesday wishing I could be somebody other than me. My head hurt and I was nauseated, dizzy, sensitive to light and sound. … You know, the usual grab bag of symptoms. I can handle that, but I’m not happy when a migraine tromps on my plans. It’s hard to make plans and then have to miss them because of the pain. Sorry, sick sense of humour here. I had my first MRI today! Go check out my pic over at my place if you like. I understand the temptation to hibernate when derailed by a migraine. I’ve learned to semi-function with them, not because I’m a masochist, but because when I get one, it can last for weeks (one time, two MONTHS! ), and that’s too long to get away with hiding. But I am smart enough to stay home when I start hurling, lol. Found your site via ChronicBabe. I’m impressed with all the remedies you’ve tried. And how often you manage to write despite headaches. My migraines appear to be caused by autoimmune disease. I recently found out that now I have plaques in my brain from this condition! So I have renewed interest in finding out how common this might be. Hope you’re able to get to a class soon and will be slicing and dicing with the greatest of ease, lol. Thanks again and I hope you are having a good day today. I was just thinking about this topic–how much migraineurs miss out on, and what we give up–because of a migraine I had from last Friday to yesterday. We may tough it out to go to work, or to do something for a family member that we promised, but we give up so much for ourselves. It’s not fair, but what can you do…I am going to follow your lead and sign up for something. Something I’ve been wanting to do but been putting off due to the pain. Yep – I’m thinking of a post called Life – Interrupted. You know that old joke, life is what happens when you’re making other plans? And so many of my migraines come in the “leisure time” – I mostly get to work and clean the kitchen (uggh – constantly!) and pay the bills but when I want some me time – Slam! 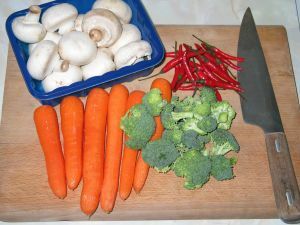 I love your veggie picture and hope you get your chance for knife skills soon! sometimes i get depressed when i think of what i haven’t done b/c of my migraines. almost all of my good friends are doctors, and i was too scared to try med school b/c i knew i could never handle being a resident with chronic migraines. i went to law school and had to leave a week into it when i was informed that my entire grade for each class would be based on one four-hour exam, and i could not miss that exam due to a “headache” without risking failing the entire class. i went to your previous post and saw your yoga story- i cried over yoga too last week! i had been looking forward to taking a yoga class and was hopeful that it might help my headaches… however, i was forced to leave 10 minutes into it b/c the instructor was burning incense and one of my main triggers is scent. Kerrie, I’ve been reading your blog for a while now. I apologize, but after a bad headache day I search out ‘the daily headache’ I suppose to remind myself I’m not the only one. This week, I concentrated on my posture (I work in front of a computer and know that I don’t hold my head and back properly). I was thrilled – Th & Fr were great. Little to no h/a pain. And then, Saturday afternoon, I was slammed by a tremendous migraine. I took a maxalt and hit the bed. My husband came home to check on me and held me while I cried like a baby. I was just so disappointed. I’m better this a.m., although still a little down. Thank you for sharing your life and knowledge on this blog. It does help. Hi Kerrie. I’d swear we were sisters because what you write about could be my life, too. For a couple of years now, I’ve wanted to take a painting class at our community college. There is a particular artist/teacher there that I want to study with before he moves on to other things. Each term, I tell myself I’m going to sign up. But then reality hits and I realize that I probably would not be able to make it to most of the classes, so I put it off. Today I leave for the Michigan Head Pain & Neurological Institute to see if they have anything that can help me. So this morning I’ll be repacking. I’m pretty scared…because I’ve tried so many other things in the past…because I don’t want anything really invasive (your wires/battery stuff are a real warning to me)…because I’m afraid that they won’t be able to help me either, and then where do I turn? Your blog is a godsend. Thank you for your honesty and candor. I admire the fact that you try to follow all the classes you signed up for. A lot of people would only complain and stick to that. Due to people like you I get new energy to start even as I do not feel well.